The club has a multipurpose centrally air-conditioned auditorium with 262 seats. It is equipped with a projection system, sound system and a cinema screen; and can be booked by members for musical shows, seminars, launching ceremonies, etc. Auditorium can be booked by the member for private functions from Monday to Thursday. Now our state of the art 3D Cinema enables you to view the latest movies right here in Islamabad Club. With luxurious seating and irresistible snacks for you to munch on, you can enjoy premium movie screening-just like you would at home! 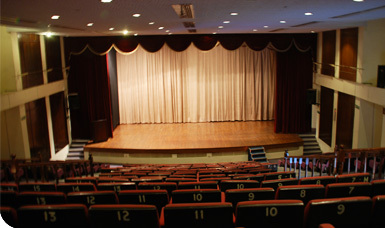 Previously used solely as the Club auditorium, the cinema has been renovated in such a way that it can still be utilized as an auditorium for personal events, seminars, launching ceremonies, musical shows etc. With a seating capacity of 262 persons, it enables a balanced crowd of individuals to enjoy the entertainment of all sorts. Club arranges Tombola on a regular basis. Bi weekly Tombola is held in the multi purpose hall on Monday and Thursday evenings. Monthly Super Tombola” on the first Monday of each month at Multipurpose Hall, a family event ensuring fun and flair for our members and their family. Grand Tombola is arranged twice a year in the back lawn of the club. Grand Tombola is one of the large events on the club calendar and is attended by a large number of members and their families.